A new U.S. Census Bureau report shows that after several years of gains, college enrollments in the U.S. fell between 2011 and 2012. But for one group—Hispanics—college enrollments were up, reflecting Hispanic population growth along with a growing share of young Latinos prepared for college. The new Census Bureau data also shows Hispanic students reached other milestones in 2012, continuing recent upward trends in educational attainment and college attendance. 1. For the first time, a greater share of Hispanic recent high school graduates are enrolled in college than whites. College enrollment rates among 18- to 24-year old Hispanics who had completed high school continued their upward march in 2012. According to the Census Bureau, 49% of young Hispanic high school graduates were enrolled in college. By comparison, 47% of white non-Hispanic high school graduates were enrolled in college. These findings reflect those of a May Pew Research Center report that showed the share of Hispanic high school graduates enrolled in college immediately after high school surpassed whites in 2012. While the share of recent Hispanic high school graduates enrolled in college has surpassed that of whites, the same is not true among all young people ages 18 to 24. Because Hispanics have a higher high school dropout rate than whites, the share of all Hispanics ages 18 to 24 in college lags that of whites – 37.5% among Hispanics compared with 42.1% among whites. 2. 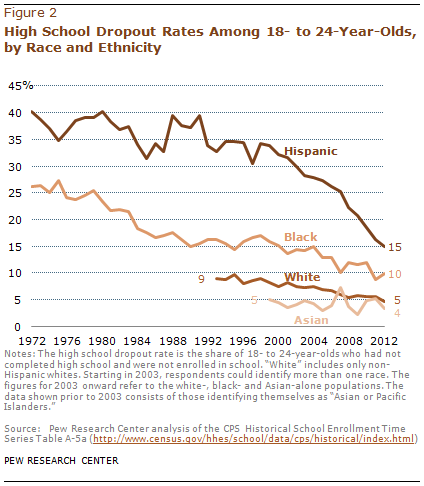 The Hispanic high school dropout rate continues to fall. The share of Hispanics ages 18 to 24 who have not completed high school and were not enrolled in school fell to a record low of 15% in 2012. That was less than half of the 32% rate in 2000. Overall, the Hispanic dropout rate is falling more quickly than any other racial or ethnic group, resulting in a closing of the gap between Hispanics and blacks, white non-Hispanics and Asians. Overall, 8% of all young adults ages 18 to 24 had not completed high school and were not enrolled in school. 3. The number of 18- to 24-year-old Hispanics enrolled in college increased by 324,000 students between 2011 and 2012, marking the third straight year of increases. The number of Hispanic 18- to 24-year-olds enrolled in college has reached a new high—2.4 million—and has been growing since 2009. By contrast, the number of non-Hispanics enrolled in college fell between 2011 and 2012. Overall, Hispanics make up 19% of all college students ages 18 to 24, up from 12% in 2008. 4. Hispanics now make up one-fourth of all public school students—a new demographic milestone. 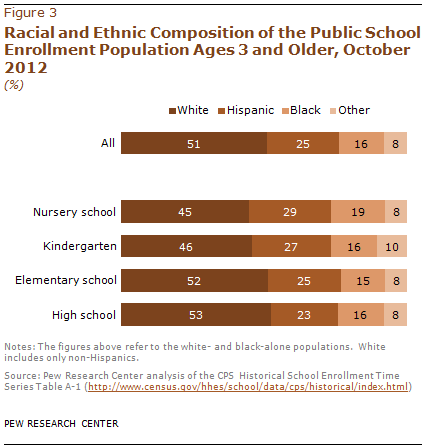 According to the Census Bureau, one out of every four public school students nationwide in October 2012 was Hispanic. The Hispanic share varies across different school levels. For example, among nursery public school students, the Hispanic share stood at 29%; among public school kindergarten students, 27% are Hispanic; and among elementary school students, 25% are Hispanic. Only among public high school students is the Hispanic share (23%) below one-quarter. Despite these recent milestones, Latinos continue to lag other groups when it comes to earning a bachelor’s degree. In 2012, 14.5% of Latinos ages 25 and older had earned one. By contrast, 51% of Asians, 34.5% of whites and 21.2% of blacks had earned a bachelor’s degree. Hispanic college students are also less likely than whites to enroll in a four-year college, attend a selective college, and enroll full-time. Even so, education is important to Hispanics. Today, a record share of Hispanic young people are prepared for college, Latino voters say education is a top issue, and Latinos are more likely than the general public to say a college degree as key to life success.